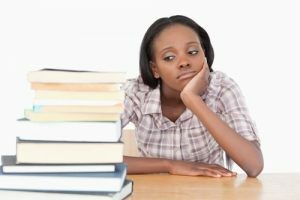 Now that college has been in session for a semester, you may be wondering how your child is faring: Is he getting all of his assignments done? Can she keep her grades up? Is he making good friends with people who can be a positive influence? Is she becoming active with activities on campus? As anxious as you may feel, try imagining it from your child’s point of view. A major university study revealed that more than 30 percent of college freshmen feel overwhelmed a great deal of the time. In high-pressure environments like college campuses, that stress can build, leading to a range of problems including depression and anxiety. Assistance is available, both on- and off-campus, for any young adult experiencing these problems, but the first step is recognizing that your child needs help. What are the signs of college-related stress? There are many potential sources of stress for college students, including academic demands, financial responsibilities, health concerns, creating and maintaining a social life, self-discovery and identity formation, and preparing for life after college. Additionally, teenagers are likely still going through significant hormonal shifts. All of these things can cause distress, which is a normal part of the college experience. However, stress becomes a negative once it starts interfering with your child’s academic performance, or if it leads to potentially unhealthy behaviors, such as alcohol abuse and experimenting with recreational drugs. While stress isn’t necessarily the cause for such behavior, it’s definitely a risk factor. To further compound obvious stress triggers, college students have a tendency to be lax about their health, ignoring obvious sleep, exercise, and nutrition components that can have a significant impact. When health issues do arise, the reaction may span two extremes – being too busy and lax and failing to get the care they need or being too impulsive and seeking a quick fix. It’s important to have an advocate who can work with your children to help them understand the implications of delaying care or rushing into decisions that are not properly informed. Often, it helps to have a neutral third-party in this capacity. That way your child won’t feel you’re threatening his or her independence and there won’t be strain on the parent-child relationship. Increasing feelings of anger or frustration. Fortunately, stress can be managed along with other related health concerns. Your child doesn’t need to deal with high levels of stress and ensuing health issues alone. Your health advisor can support your children while allowing them to maintain their independence. This can range from appropriate guidance for managing stress, dealing with addictions, or coordinating with physical or mental health providers who work on your child’s campus. Together, you can develop a plan for managing stress in healthy and constructive ways that align with your child’s preferences and academic needs. College should be a time for your child to grow and discover who he or she wants to become. Stress is a major part of life at any age, and your child will need to learn how to deal with it in a healthy way. He or she shouldn’t have to feel alone in doing this, and with the right resources to turn to, your child will be learning valuable skills that will be useful throughout life.